Alan Sorrell’s reconstruction of Star Carr shortly after the original excavation in 1951. The Mesolithic period dates between 10,000 BC and 4000 BC, when people were nomadic hunter-gatherers. This period occurs at the end of the last ice age and continues until the first farmers of the Neolithic began settling down and domesticating their animals. 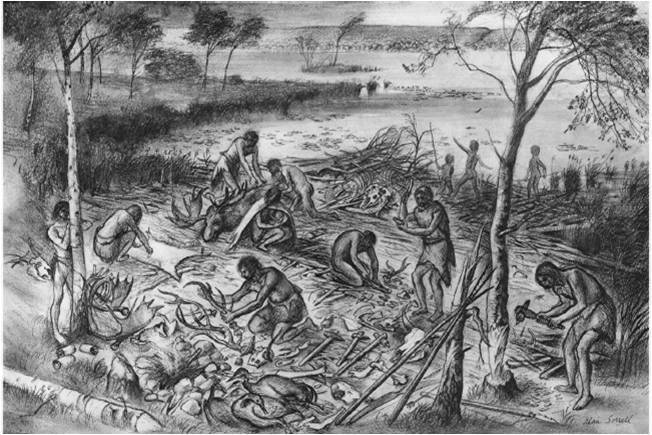 The image above sets the scene, with people processing animal carcasses of red deer for food and using specialised tools made from their bones and antlers. The deer skins could also be used, not only for clothing, but as sacks and water carriers. Particularly associated with the Mesolithic period are small flint blades, of various shapes, known as ‘microliths’. There is archaeological evidence to suggest that these blades were used to provide tips and barbs of arrows fitted to handles of bone and wood. These tools were then used for various tasks, including hunting, fishing, building shelters and making clothing. Fire was an important element for Mesolithic life, practically used to clear the reed beds around the seasonal Star Carr site which was situated on the edge of a lake surrounded by open woods of birch and pine trees. People collected berries, seeds, nuts and fruit from the open woods, and hunted for fish and wild game. Night-time was very significant to their lives, the moon directing them through the landscape, perhaps used as a guide during hunting red deer. The site at Star Carr is much more about the day-to-day lives of the Mesolithic inhabitants, rather than their views on the afterlife. There are very few examples of Mesolithic burial in Britain, but we do have one fantastic example at Aveline’s Hole, Mendip Hills, Somerset, England, of a large group of bodies buried inside a cave. What objects suggest a shamanic interpretation? For me, the most important and suggestive shamanic objects found at Star Carr are the antler items. During the excavation of the site, twenty-one adult red deer skull parts with antlers were found. There is evidence of cut marks on the remaining skull, made by flint tools – showing that the skin was deliberately removed from the skulls. The nose skull parts were broken off and the edges worked down. Each of these had holes made through them, perhaps to hold leather straps to tie them to the head. 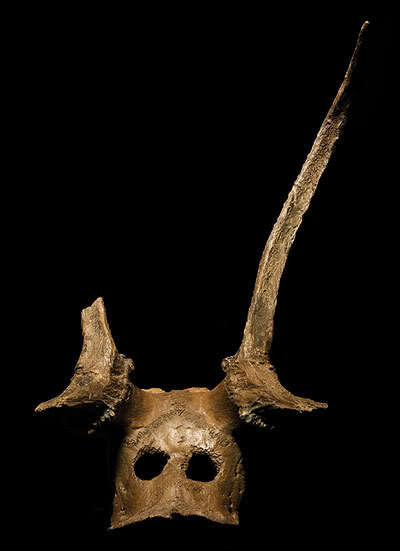 Archaeologists have suggested that these were antler head-dresses worn by hunters as a disguise, or used as part of a costume worn on special occasions, perhaps during important ceremonies. An antler head-dress, perhaps used as part of a shamanic disguise. The very act of dressing up for a special occasion has been around for thousands of years, regardless of the time and culture. A special costume emphasises a certain aspect, mood or personality and is especially associated with shamanism. One major characteristic in a shamanic costume is the head-dress, headband or blindfold. All over the world, head-dresses are used to increase concentration during meditative exercises. Closing your eyes to the visible world may keep you from being distracted by things of this world during trance. The head-dresses could also have been part of a disguise, used to trick spirits who cannot effectively attack a shaman wearing a powerful costume, or recognise the shaman without a costume. A shamanic costume is also used to effect the spectators, and items were added which reflected a specific worldview. Feathers were commonplace, usually from birds of prey, with leather thongs hanging from the sleeves symbolising wings. Costumes could also have images or small pieces of bone, human or animal attached, as they are linked to the symbolic death and rebirth experience. Antlers and horns are another common symbol, primarily found on head-dresses. Antlers may have symbolised a connection with the deer species and with hunting, but they may also have been used to connect with the wider universe, reaching out into the cosmos from the top of the head like antennae. Like the life tree (and the Axis Mundi, see Palaeolithic shamanism), the branches of the antlers stretch out into the upper world, becoming channels for messages from higher spirits and levels. It is also noted that by wearing antlers shamans can become deer, mimic their movement and behaviours and experience what it is like to be a deer. The Siberian Tungus shaman below is said to use antlers as his shamanic animal in trance, experiencing himself running like a deer to the otherworlds. 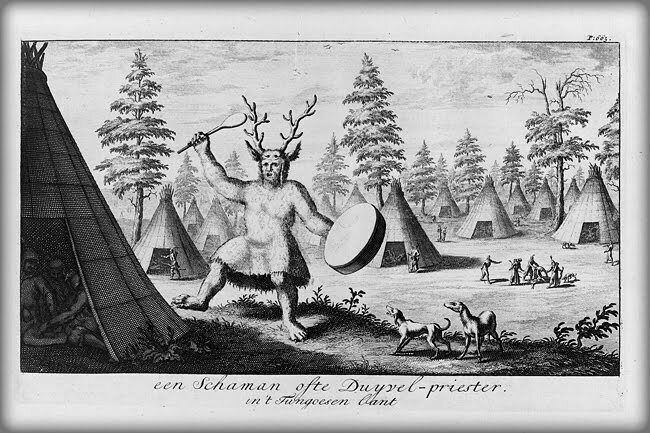 Tungus shaman, detail of an engraving from Witsen’s Noord en Oost Tartarye, 1785. Perhaps similar acts were performed during the Mesolithic period in Britain, with costume playing key roles in ceremony and hunting. Many archaeologists have suggested that the supernatural was important during this period with natural places such as hills, waterfalls, rivers and caves thought to be powerful animistic entities. Animic worldviews consider the world to be full of persons, only some of whom are human. Next time, I’ll be exploring the animistic world of the shamans during the Neolithic period of Ireland…. Could you tell me where the picture of the antler head-dress is from please? I can’t find that particular one on the British Museum website, but they do have another smaller one from Star Carr. Do you have anything on Native American Shamanism please. Native American Shamanism is probably one of the most over talked about forms of Shamanism (so much that you start finding new-age crap that steals from it) it shouldnt be hard at all for you to find stuff about it. Have you thought that these “masks” could just be normal every day objects it would explain why there are so many of them and why they were discarded, sacred objects are normally rare and don’t normally just get abandoned. Possible uses for these items could be ruck sack frames or they could be tied to the posts in the shelter and act as hooks for hanging things from ? Just some ideas?